Islabikes is best known for making good quality children’s bikes. Owner, Isla Rowntree, developed the children’s bike range when she found her friends’ children needed bikes, but that there wasn’t anything out there that met their needs. A similar desire to meet an unmet need has driven the development of the new ‘Icons’ range: as Isla’s parents have grown older, the effects of ageing have left them restricted in their enjoyment of their existing bikes. The Icons range consists of a ‘Janis’ road bike, ‘Joni’ urban bike, and ‘Jimi’ mountain bike. Check out the article here for details of the range. 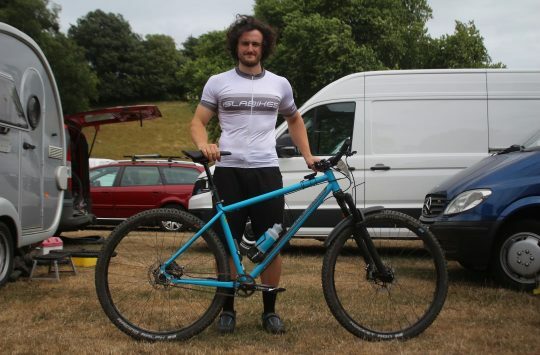 We were lucky enough to have a Jimi for a short period of test riding before the launch of the Icons range. As well as riding it ourselves, we got tame member of the target age group to take it out for a spin. But before we get to the ride, let’s check out the design features that make this a mountain bike for the older generation. Isla came to visit and talked us through the design features of this bike. This is a mountain bike designed for those that want to ride off road, but with their wheels on the ground. 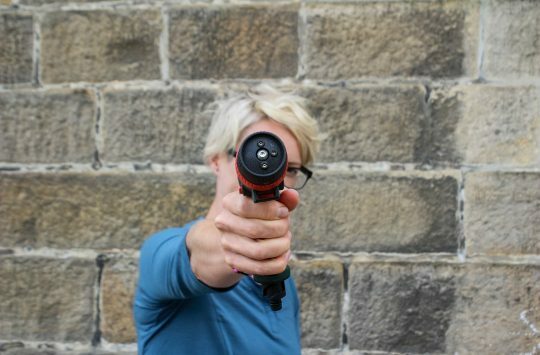 Aimed at those who ride more cautiously, and with a view to avoiding crashes and falls, features are designed to help offset some of the physical difficulties that ageing can present. One of the most noticeable features of this bike is the weight. At 9.9kg for a Medium frame, it is noticeably light, belying its appearance perhaps. As the ability to produce power reduces, having a light weight bike becomes more important – just as it does for the lower power outputs of younger children. 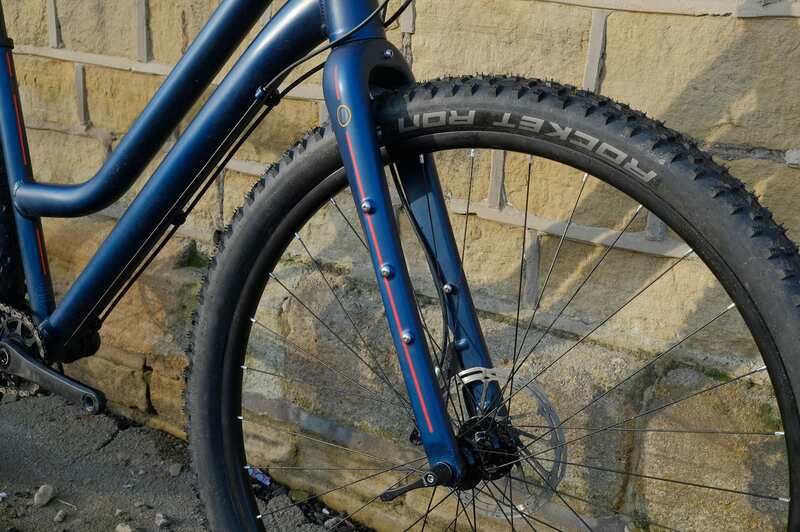 This low weight is achieved in part by the inclusion of a carbon rather than suspension fork, with Isla thinking that those who need a suspension fork will likely find other bikes in the market to suit their needs. 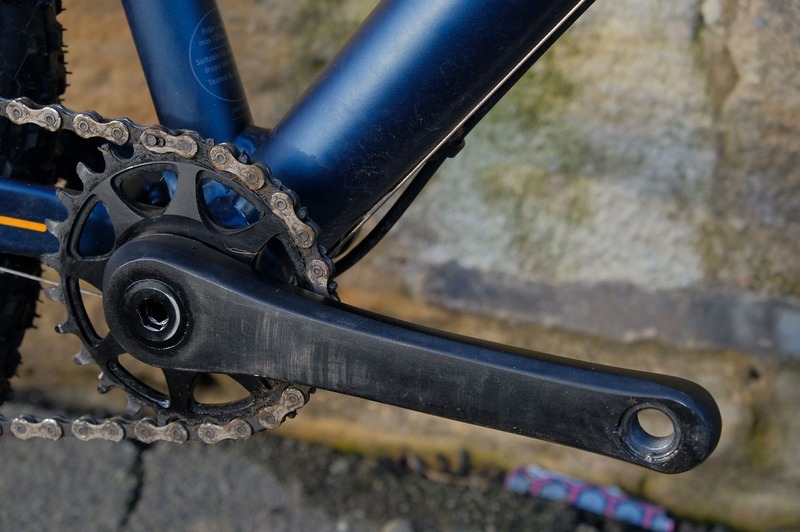 The reduced strength of the target market is also recognised in the low gearing: a 10 speed 11-40T Sunrace cassette is teamed with a 26T chainring, for easier sitting and spinning up inclines balanced against decent speeds on the flat. Isla believes that these design features will suit the rider who has reduced strength but retains aerobic fitness – giving them an alternative option to the often-suggested e-bike. Another immediately obvious feature is the step through frame, but this is not a women’s mountain bike for fans of full skirts and Victorian bustles. The step through frame is there to make it easier for riders with reduced mobility – particularly in the hips – to get on and off the bike, and should also provide confidence for those with reduced balance. Tackling the impact of reduced mobility can be further mitigated by the addition of a dropper post (which is an optional extra for all the bikes in the Icons range) to allow easier mounting and dismounting. Another nod to reduce mobility comes in the form of the cranks, which are Islabikes’ own shorter direct mount cranks, for a narrow Q-factor and crank lengths which are optimised to each bike size. Twist shift and short reach brakes. Turning to finer motor skills, the bike features a grip shifter – which is also specced on children’s Islabikes as Isla thinks this is easier for weaker hands to manipulate than a thumb shifter. The rims are a special ‘Easy-Tyre-Change’ profile – they’re not tubeless ready – so that it is easier to get tyres off in the event of a puncture. Isla’s experience with her parents is that a fear of being far from anywhere and unable to change a flat has kept them from riding as far and wide as they would like to do. By making it easier for weaker hands to get the tyres on and off Isla hopes that older riders will retain the confidence needed to continue to ride as far as their bodies will allow. 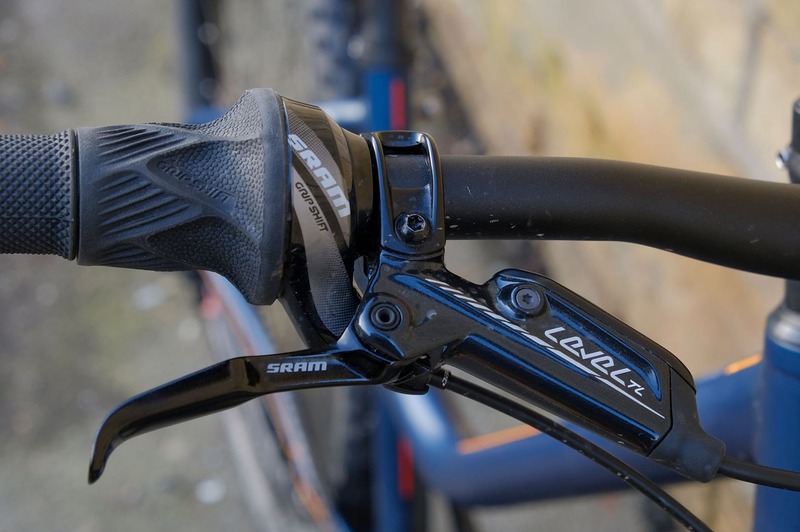 Also taking into account the effect of age – and perhaps arthritis – on hands, the SRAM DB Level TL hydraulic disc brakes are short reach and require only a low force to brake. These are fitted to bars which vary in width across the sizes, from 680mm in the small to 720mm in the large – narrow by modern standards, but Isla says she has designed the bike to feel familiar to those who perhaps started riding in the early days of true ‘mountain bikes’, when today’s long, slack, low and wide ride positions had not yet been conceived. For those considering ‘touring’ (bike packing is more likely known to this target generation) there are plenty of mounts for racks and panniers of all shapes and sizes. Perhaps even for a seat for a small grandchild? ‘The Ride‘ section of this review is for members only. If you have an account, please log in. If not, you can get access by registering here for free. 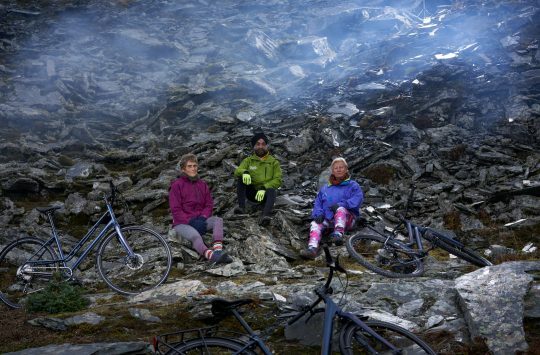 I love this idea of making mountain booking more accessible to not just older people, but also any one else with different abilities. Cool bike. It should have a QR on the seat post. That would make it safer and easier to get in and out of cars. 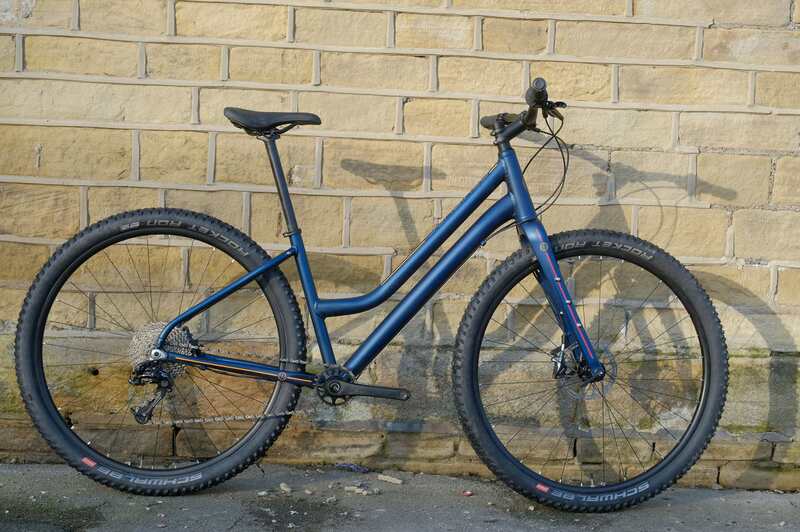 I think this sort of MTB is perfect answer for someone like my Wife, who wants a ‘townie’ that can easily handle the off-road terrain like towpaths and the southdowns that fit her idea of a nice ride without the traffic. Spot on. A fantastic idea well executed. Yep. Speaking as a long-over-60-something still riding my MTB but having increasing difficulty with emergency dismounts, I could easily see one of these in my future. Especially impressed with the twist grips – I have arthritis in my hands & the pain in my thumbs after an hour of shifter use converted me to twist grips 10 or 15 years ago. Regular paddle shifters (SRAM Apex1) are OK on my straight bar road bike but I think I don’t change gear nearly as much on the fairly flat roads round here as I do on the local XC trails. Having seen this in the flesh it’s an odd-looking thing, but it’s unbelievably light, and as well thought out as all Isla’s bikes. The industry is pushing e-bikes as an antidote to aging, but I reckon something like this would suit a lot of riders who aren’t as strong as they used to be, but don’t need all the work doing for them. I thought people who couldn’t ride mountain bikes bought YT Capras!? This is the best thing I’ve seen in bikes in a while, great stuff. What a great bike! Bought my wife a Benn 29 a few years ago, which she loves. Hope they do well with this one. This is exactly what my wife wants at 39. 6 months post heart transplant. This makes a lot of sense. The dreaded ebikes might get older people up a hill, but they’d just about give me a hernia hefting one out of boot or onto a bike rack, let alone my mum… I was about to mutter about islabike pricing, then remembered my dad can afford to fly to Portugal this week for a bit of winter golf – so there are probably plenty of grey pounds to go round!